For the Holy Week and Easter Schedule, go to our Home Page. Monday-Saturday: 6:00 & 8:00 a.m.
Saturday Vigil for Sunday Mass: 5:00 p.m.
Sunday: 7:30, 9:00, 11:00 a.m. & 5:00 p.m.
Latin High Mass: Sundays at 1:00 p.m.
Holy Days of Obligation: 6:00, 8:00, 10:00 a.m. and 7:30 p.m.
First Friday Mass each month: 7:30 p.m. THE HOLY SACRIFICE OF THE MASS is the heart of the Church's life; it is the Source and Summit of the Christian life. Catholics have an obligation to attend Mass every Sunday; however, let us not think of it so much as an obligation but more as a privilege. If you would like to read the Sunday Mass Readings in advance, as well as learn more information about each reading, click here (courtesy of St. Louis University's "Sunday Website"). To see which priests will be celebrating the various Masses, click on the separate link above, MASS CELEBRANTS. To read more about the Latin Mass (including celebrating the Sacraments of Baptism, First Communion, and Marriage in the Latin Rite, click on the main link, LATIN MASS/RITES. Wednesdays from 7:00 - 8:30 p.m. AND Saturdays from 3:30 - 5:00 p.m. THE SACRAMENT OF PENANCE obtains pardon from God's mercy for the offenses committed against Him and, at the same time, reconciles the penitents with the Church which they have wounded by their sins and which by charity, by example, and by prayer, labors for their conversion. This sacrament is the first step in returning to the Father from whom one has strayed by sin. The disclosure or confession of sins to a priest is an essential element of this sacrament as the priest can withhold forgiveness if the person is not truly sorry or does not intent to stop committing the sin in question. In a profound sense, confession is also an acknowledgment and praise of the holiness of God and of His mercy toward sinful man. 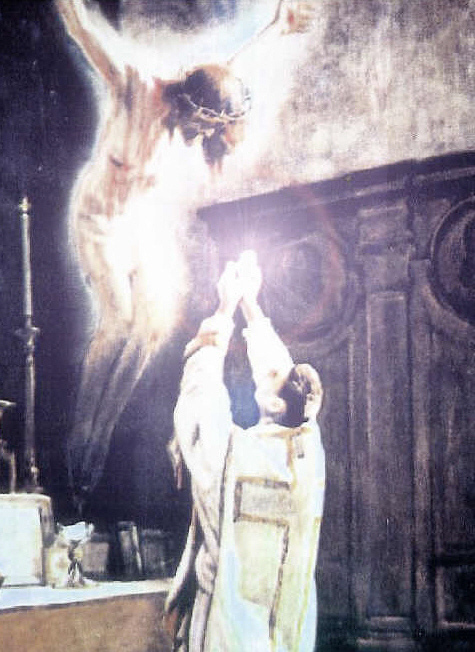 Through the priest's sacramental absolution, God grants the penitent "pardon and peace." The sacrament imparts to the sinner the love of God who reconciles us to Him: "Be reconciled to God." He who lives by God's merciful love is ready to respond to the Lord's call: "Go; but first be reconciled to your brother." 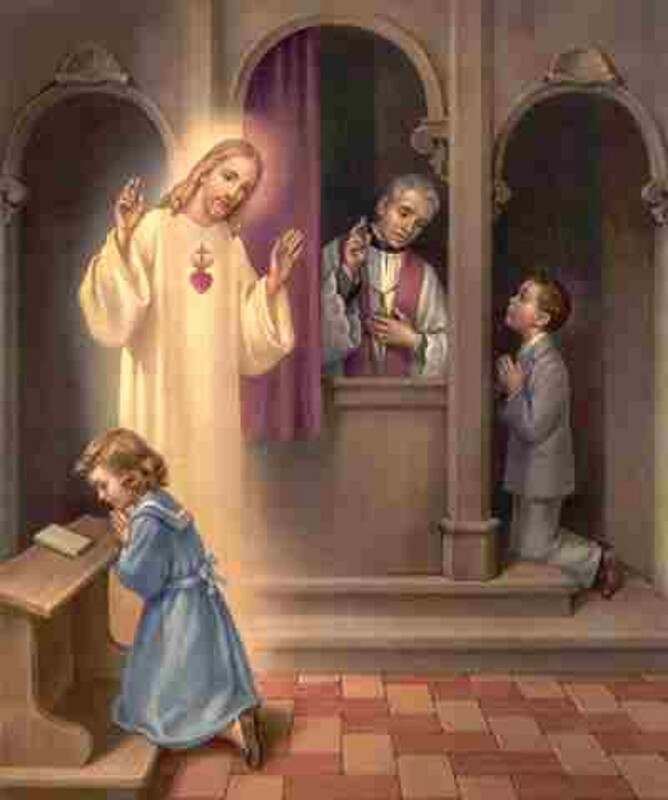 The institution of the Sacrament of Reconciliation (also known as the Sacrament of Penance or Confession) occurred on the first Easter Sunday, when Christ first appeared to the apostles after His Resurrection. Breathing on them, He said: “Receive the Holy Spirit. Whose sins you forgive, they are forgiven; Whose sins you retain, they are retained” (John 20:22-23). The Purpose of Confession: The reconciliation of man to God is the purpose of Confession. When we sin, we deprive ourselves of God’s grace. And by doing so, we make it even easier to sin more. The only way out of this downward cycle is to acknowledge our sins, to repent of them, and to ask God’s forgiveness. Then, in the Sacrament of Confession, grace can be restored to our souls, and we can once again resist sin. 1. One must be contrite—or, in other words, sincerely sorry for his/her sins. 2. One must confess those sins fully, in kind and in number, with an intention to no longer commit those or any sins. 3. One must be willing to do penance and make amends for his /her sins. Why Is Confession Necessary? : Non-Catholics, and even many Catholics, often ask whether they can confess their sins directly to God, and whether God can forgive them without going through a priest. On the most basic level, of course, the answer is yes, and Catholics should make frequent acts of contrition, which are prayers in which we tell God that we are sorry for our sins and ask for His forgiveness. But the question misses the point of the Sacrament of Confession. 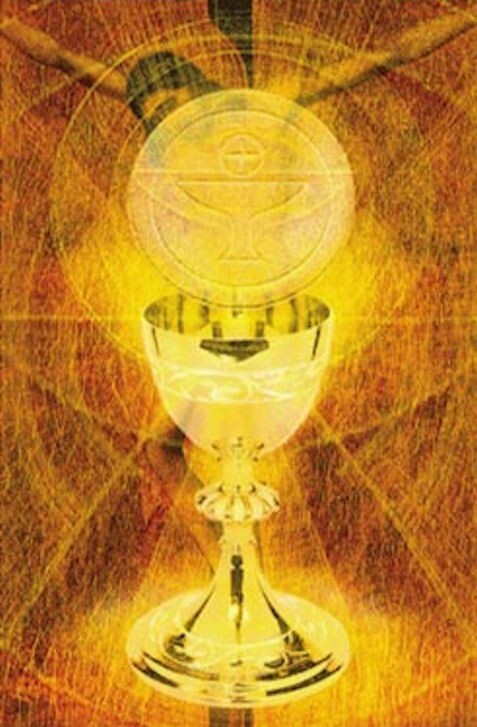 The Sacrament, by its very nature, confers graces that help us to live a Christian life, which is why the Church requires us to receive it at least once per year. Moreover, it was instituted by Christ as the proper form for the forgiveness of our sins. Therefore, we should not only be willing to receive the sacrament, but we should embrace it as a gift from a loving God.